Expect to see the new model in all its glory sometime tomorrow. Ford has just announced via their Explorer Facebook page that tomorrow, March 28 at 1pm EST, news of "an exhilarating new model" for the Explorer lineup will be revealed via a live webcast. With the announcement came this 26-second video teasing what appears to be a high-performance variant of the Explorer. All that&apos;s revealed is a mesh grille, a beefy, throaty exhaust, and body-color alloys. 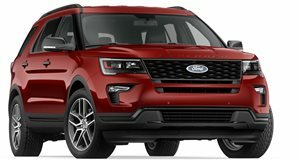 The performance-oriented muscle CUV is expected to house a 3.5-liter EcoBoost V6 engine, good for 365hp and 350lb-ft of torque, driving all four wheels. In any event we&apos;ll have the full picture in just a day&apos;s time so stay tuned for more information as it comes in. Photos are of the 2011 Ford Explorer.